A day trip to beautiful Ronda is a “must do” when in southern Spain! While in southern Spain I have ventured to several nearby places. Previously I have mentioned my day trip to Gibraltar and in this post I am going to write about my journey to Ronda. Ronda is only a short bus or train ride away and I went by bus on a small group tour. The town is high in the mountains and there are plenty of twists and turns to get there. Like so much of Spain, there is a great deal of history and different cultural communities associated with Ronda. It dates to prehistoric times and has seen settlement by the Celts, Phoenicians, Romans, Visigoths, Arabs, and Spanish. Today’s architecture reflects the influence of Arabs and Spanish. 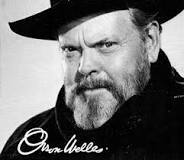 Earnest Hemingway and Orson Wells lived portions of their lives in Ronda and Wells is buried there. Although these individuals are well known for their literary and theatrical contributions, the town of 35,000 and the country have been heavily influenced by bull fighting and is reported to be the home of the sport. Outside Ronda’s Plaza de Toros is a statue honoring the most famous matador, Pedro Romero Martinez, who allegedly fought 5558 bulls without being seriously injured! 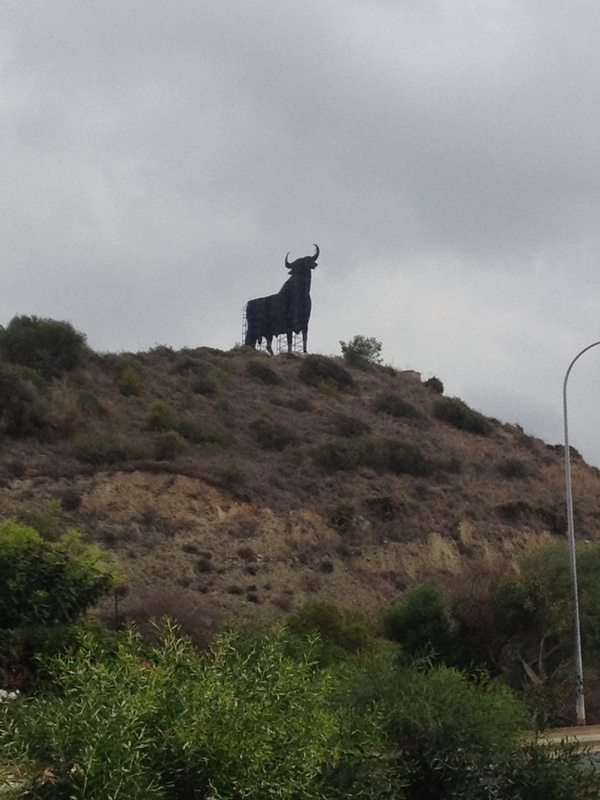 Across Spain are 30 foot high monuments to bulls and the sport as seen in the photo. Of the most famous of landmarks in Ronda, though, is the Puente Nuevo or the “New Bridge.” The name is misleading as the New Bridge construction began in 1751 and was completed in 1793. This massive structure is about 390 feet above the canyon floor and connects the two parts of Ronda. In the photo, can you see the people standing on top? 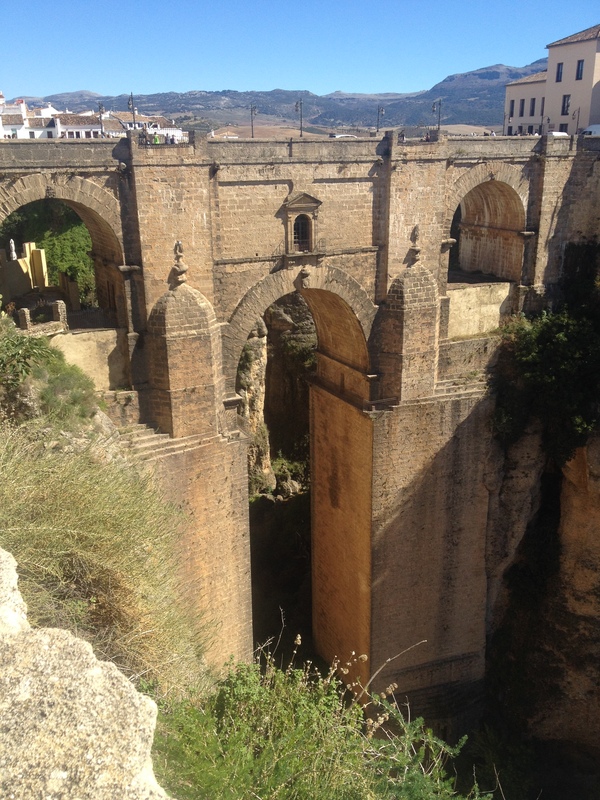 The bridge not only connects the town but also was a part of the judicial system in Ronda where once found guilty of a capital offense, the guilty party was quickly tossed over the edge to his death. Ronda is a beautiful town but does have a large number of tourists in it. I love Ronda, the sites and the food. There are places to eat everywhere and serve a variety of dishes from all over the world. Next Next post: Mallorca – Winter Next Year? Barry's Adventures Following Retirement Create a free website or blog at WordPress.com.